It’s not a story you hear every day in the aquaculture sector: three childhood friends teaching inner-city kids to grow food (tilapia, in this case) in an area of Cleveland, Ohio, known as “The Forgotten Triangle.” The population and investment in The Forgotten Triangle have declined dramatically in recent years, and the neighborhood has experienced extreme abandonment and neglect. Friends Damien Forshe, Keymah Durden and Randell McShepard couldn’t bear the direction their neighborhood was headed in, so they launched The Rid-All Green Partnership. With the collaboration of investment partners, the three friends are trailblazing Cleveland’s sustainability movement. 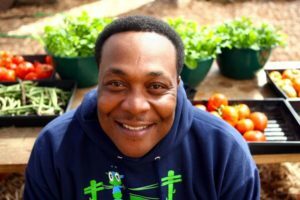 The mission of the Partnership is to turn neighborhoods into viable and sustainable communities through healthy and educated food choices that can change outcomes in the health disparity issues many communities face. To the co-founders, it’s about protecting the next generation by guiding what they’re eating and how they’re spending their time. On average, inner city neighborhoods in Cleveland experience over a decade decrease in life expectancy when compared with those who live outside of it, and the infant mortality rate among African Americans in Cuyahoga County is more than triple the national average. The Rid-All Green Partnership encompasses many initiatives, but the primary for-profit is Urban Fish Farm LLC where they raise tilapia, bluegill and prong. 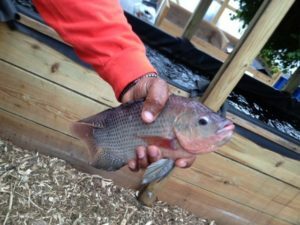 The farm is located on a greater urban farm producing fresh vegetables, rich compost and jobs for inner-city residents, alongside their fish. Urban Fish Farm sits on approximately one acre of land in the 23-acre Urban Agricultural Innovation Zone, making it the perfect location for local kids to play an active role in aquaponics farming and composting. Urban Fish Farm started with raising about 600 tilapia per year, with local restaurants eagerly scooping up their supply. They have now established a facility with the capacity to raise over 100,000 tilapia every eight months. This success has led them to the point where they are seeking Best Aquaculture Practices certification. “We were so excited when Urban Fish Farm chose to become a member of the Global Aquaculture Alliance, because it signals to us that we’re reaching the aquaponics sector in a meaningful way and that aquaponics farms are realizing the need to partner with industry in order to gain traction as a global solution to the food crisis,” said Becky Holt, GAA’s Membership Manager. “Let them be an example for what the entire aquaculture industry should strive for, which is the betterment of our communities through place-based education and consideration for our natural environment — even urban ones!”. 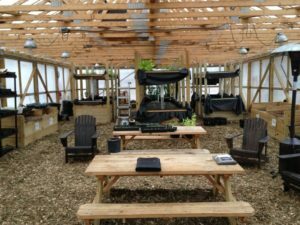 This group is shattering the definition of small-scale aquaponics initiatives by setting up aquaponics training centers in Buffalo, Atlanta, Belize, Israel and Africa. GAA’s vision is a world that embraces and enables the role of responsibly farmed seafood in meeting global nutrition needs, and The Rid-All Green Partnership is certainly a driver of that vision. 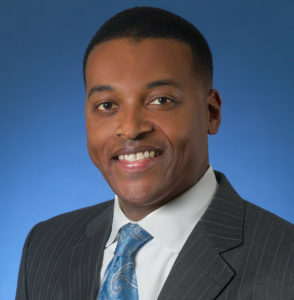 “The Urban Fish Farm leadership could not be more excited about our new partnership with GAA and the aligned values we share regarding the importance of the unique opportunity to provide responsibly farm-raised seafood on a local, national and global stage,” said Randell McShepard, co-founder of the Rid-All Green Partnership. Damien Forshe, one of the co-founders of The Rid-All Green Partnership, was a leader in the food revolution until his untimely passing in November 2018. May his work and vision continue through his family and team at The Partnership. 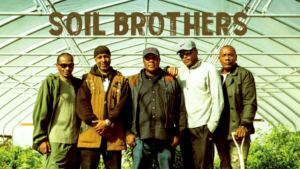 Watch these friends in action in the film Soil Brothers. Looking for more films about aquafarming? Watch our films. Become a Member of GAA today.